[Training eyes = quick analysis of light information entering eyes by the brain] and creation of the next action and transmission of it. In short, training eyes = training the brain!! 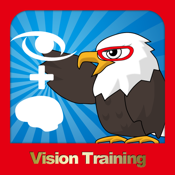 Vision Training helps your eye ability! Dynamic Visual Acuity(The Shuffle), Rapid Visual Search Acuity(Flash Numbers), Eye's Move(Ladder Lottery), Peripheral and Vision & Operate(LR Diff). We also prepared advanced trainings as a pay package. It includes 4 games; Air Hockey, Whack Crows, the Touch and Slot!